Original Editors - Len Coughlin from Bellarmine University's Pathophysiology of Complex Patient Problems project. Cluster headaches are the rarest but the most painful of the primary headaches which include trigeminal autonomic cephalaligias (TACs), migraines, and tension type headaches. Of among the TACs, cluster headaches are the most common. Primary headaches are caused by spontaneous activation of nociceptive pathways. Cluster headaches are characterized by recurring short lasting attacks ranging from 15 to 180 minutes but typically averaging around 45 to 90 minutes. The attacks typically consist of exruciating unilateral periorbital or temporal pain described as a sharp, pulsating, pressure-like, burning, and/or piercing pain that often presents on the right side of the head. Also, at least one ipsilateral autonomic symptoms is necessary for diagnosis. Accompanying ipsilateral symptoms include conjunctival injection and lacrimation, nasal congestion or rhinorrhea, forehead and facial sweating, facial flushing, eyelid edema, miosis and ptosis, and a sense of restlessness and agitation. There are two types of cluster headaches, episodic and chronic. Episodic is defined by periods of susceptibility to headaches known as cluster periods that alternate with periods of remission. A cluster period of 1 to 3 months occurs where patients experience 1 to 8 attacks/day, followed by remission for months to years. With the episodic classification, headaches can then reoccur in the same pattern after remission. These patterns occur with clock-like regularities and have been found to be more prevalent with season change. Chronic is defined by the cluster periods occuring for one year or more, without any remission or a remission period lastly less than one month. Chronic headaches are preceded by episodic headaches and develop overtime. Around 80% of all cases are episodic headaches, where as around 20% of all cases are chronic headaches. Cluster headaches (CHs) are reported as affecting either 1% to 4% of the population with 0.4% prevalence in the population of the US. Other sources have the prevalence at 0.5 - 1 out of 1,000 people. One study reported 2.73% of patients in a tertiary care headache clinic being diagnosed with cluster headaches. CHs are diagnosed most commonly in men between the ages of 20 to 50 and onset of the condition typically occurs in the third decade. African American males have a higher incidence of CHs than other racial backgrounds and increased recognition of the disease in women is causing the ratio of men to women with CHs to decrease. There appears to be a correlation between the development of CHs and previous head trauma, up to 18% of a 1,134 population survey. Children are rarely diagnosed with CHs and symptoms often decrease after the age of 70 years old. Some studies have found there to be a genetic predisposition to developing CHs. Attacks usually occur at the same time each day, often when a patient wakes up from an afternoon nap or sleep during the night. CHs follow a circadian rhythm and cluster periods occur during the same time each year. They occur most commonly after the shortest or longest days of the year. Pain is described typically in the area of the first trigeminal branch and almost always on the same side of the head. CH is described as one of the most painful conditions known to man and female patients say the pain is worse than giving birth. Patients compare the sensation to a red hot needle or nail being driven into their eye, or their eyeball being ripped from its socket. Pain increases suddenly and remains incredibly intense for 15 to 180 minutes until it suddenly subsides. In one study, those with CH showed bilaterally lower pressure pain threshold over cranial peripheral nerves when compared with the general population. Suicidal ideas or feelings are somtimes expressed because of the severity of the pain and CHs are sometimes referred to as "suicide headaches." In survey research, 55% of 1,134 people diagnosed with CH had suicidal thoughts and 2% had attempted suicide. Physical activity seems to alleviate pain during a CH so patients often prefer standing or sitting erect over lying down or reclining. During the cluster period, patients are restless and may rock from side to side, hit their heads, hit objects with their fists or even hit their head against a wall. This behavior is so typical that it is accepted as a criterion in the International Classification of Headaches Diseases (ICHD-II). Diagnosis of cluster headache is based on whether symptoms meet clinical criteria and exclusion of a secondary cause. Obtaining a detailed clinical history is very important because of the lack of ability of diagnostic tests to confirm a patient has CHs. The most important clinical features are the severity and location of the headache, shortness in duration, the frequency of attack, and associated autonomic symptoms. Misdiagnosis of this condition is common; therefore, appropriate treatment is often delayed. It can take from 3 to 9 years to make a correct diagnosis. Many individuals with CH will present with at least 3 autonomic symptoms, but only one is necessary for a diagnosis. In order to differentiate between episodic and chronic CHs another set of diagnostic criteria is used. B. At least two cluster periods lasting from 7 to 365 days and separated by pain free remissions of > 1 month. B. Attacks recur for > 1 year without remission periods or with remission periods lasting < 1 month. Any patient with a refractory (unmanageable) case should undergo an MRI to exlude any treatable cause. The pituitary, orbit, and trigeminal pathway have to be specifically examined with a CT Scan and MRI. The exact cause of CH is unknown, but it appears to have multifaceted components and dysfunction at many levels. The neurovascular aspect is evident by the effects of vasoactive substances on CHs. Vasodilators trigger CH attacks and vasoconstrictors end them. Vasodilation of the opthalmic and internal carotid arteries occurs ipsilateral to the pain. It is unclear whether activiation of the trigeminal vascular system is a cause or consequence of CH. One study proposes that the combination of calcitonin gene-related peptide, substance P, and neurokinin A that are found in high concentration during both spontaneous and provoked CHs provides evidence for a neurovascular relationship. The stimulation of the trigeminal comlex causes a cerebral vasodilator response. The cerebrospinal fluid changes in a way that indicates autonomic (parasympathetic and sympathetic) and central nervous system involvement in CH. The periodic patterns of CH have directed studies toward the hypothalamus which controls the circadian rhythms. PET studies show an activation of the posterior hypothalamus during CH attacks. The CH period is also characterized by disturbances of neuroendocrine substances (prolactin, testosterone, thyroid stimulating hormone (TSH), and cortisol) based on circadian rhythms. Decreased testosterone and alteration of hormone and melatonin production occurs during the cluster period. Platelet levels of histamine and serotonin increase during the episode of headache and decrease when the headache is over. Mast cells, the major source of histamine in many tissues, are found in increased number in the skin of the painful temporal area in cluster headache patients. This is particularly evident within the first 10 hours after a cluster attack. Blood pressure increases, heart rate decreases during a cluster period. This may indicate an involvement of the carotid body because of the impact its receptor has on blood pressure and heart rate. Leroux and Ducros state that "the parasympathetic component of the autonomic symptoms is thought to be mediated by the trigeminal-autonomic reflex in the brainstem circuitry,via the seventh cranial nerve. The sympathetic innervation pathway to the pupil and eyelid is composed of three neurons and there is no clear demonstration of the site involved and mechanisms underlying the dysfunction in CH." There is no unified hypothesis that adequately explains all of the clinical occurences associated with cluster headaches. Trigeminal complex is main source of involvement. Due to possible causes and comorbidities, the central nervous system and cardiovascular system are involved with CH. A very useful article regarding management of CH can be found at American Academy of Family Physicians Online. It is linked HERE and at the bottom of the page under case reports. Triptans, such as sumatriptan (Imitrex)-- can be administered via subcutaneous injection (most common) or nose spray. Subcutaneous injection may be contraindicated for patients who have coronary artery disease, uncontrolled hypertension, or angina. The inhalation of 100 percent oxygen, via a tight-fitting mask at a flow rate of 8 to 10 liters/min for 10 to 15 minutes is dramatically effective for about 80 percent of those patients for whom this approach is feasible; oxygen is particularly effective for nocturnal attacks. Oxygen inhalation can be repeated up to 5 time a day. Studies have shown significant cerebral vasoconstriction with inhalation of 100% oxygen during a cluster headache. Oxygen also increases the synthesis of serotonin by the CNS. A combination of medicines may be needed to control headache symptoms. Because each person responds differently to medicine, your doctor may have you try several medications before deciding which works best for you. Verapamil: This drug is most commonly used for patients with cardiovascular disease; however, higher dosages are used for patients with CHs. Adverse effects may include: constipation, dizziness, edema, nausea, fatigue, hypotension, and bradycardia. Lithium: This drug is commonly used to treat bipolar disorder. Adverse effects may include: tremor, diarrhea, polyuria, hypothyroidism, and renal dysfunction. For patients who show no response to conservative medical management, several surgical procedures have been implemented. Surgeries in the past have been directed toward the sensory trigeminal nerve such as percutaneous glycerol injections into the trigeminal cistern, trigeminal sensory rhizotomy, percutaneous radiofrequency trigeminal rhizotomy, superficial petrosal neurectomy, trigeminal branch avulsion, and decompression of the nervus intermedius. A recent study questions the efficacy of such surgeries due to the limited positive results and adverse side effects. Currently, the most promising surgeries would include deep brain stimulation of the posterior hypothalamus and occipital nerve stimulation, with initial outcomes showing a 50% attack reduction. Long term studies reveal it may take several weeks or months for a change in the brain's pain processing patterns. The preferred practice pattern for CHs is 5D: Impaired Motor Function and Sensory Integrity Associated with Nonprogressive Disorders of the Central Nervous System-Acquired in Adolescence or Adulthood. Goodman states that "the use of thermal and EMG biofeedback may be of benefit." Educating patients on common triggers of CH and things to avoid is important for the PT. Instruction about precipitating factors which include alcohol, abrubpt changes in sleeping patterns due to travel, and work shift changs is important. Other precipating factors include lack of sleep, naps, burst of anger, prolonged anxiety, or altitude hypemia during flights. Also since physical activity seems to alleviate pain in CH patients, aggressive exercise can help improve symptoms. It is important to keep in mind many patients with CHs will be on medications that may cause systemic adverse effects. Being aware of the patient's medication is important because they may directly affect exercise. There are a wide variety of alternative management techniques that can be found, all of which have little validity based on research. However, some do offer promising results and should be considered when dealing with cluster headaches due to the debilitating nature of the condition. Sutton and Herbert report that "a retrospective analysis found that LSD and psilocybin (“magic mushrooms”) not only interrupted cluster headaches, but blocked successive headaches in the cluster in 53 patients.14 These drugs were also shown to increase the remission period between cycles, a key efficacy characteristic." The long term efffects of this type of therapy is relatively unknown and the use of illegal drugs often appears negative to the patients. Patients with severe snoring and cluster headache should be evaluated for sleep apnea. In some patients diagnosed with sleep apnea, treatment for apnea also proved to be effective for the headaches. Botulinum toxins A and B are being studied as treatments for various headaches, with evidence of some efficacy and mixed reports as to side effects. A study by Sostak et al. looked at the effects of Botulinum toxin type-A in an open study and found positive results in 4 out of 9 patients. A recent report described a patient with intractable cluster headache; PET scanning revealed activation of the posterior inferior hypothalamic gray matter during attacks. A stereotactic electrode was implanted in this area, with a permanent generator placed in a subclavicular pocket. When stimulation was provided at a frequency of 180 Hz, the attacks disappeared after 48 hours. Twice, the stimulator was turned off without the patient’s knowledge, and attacks returned within 48 hours. The latter attacks disappeared 48 hours after the generator was restarted. Thirteen months later, the pain had not recurred. Other alternative treatments mentioned in articles included acupuncture, point stimulation, and dietary changes. The major theme with any treatment is that if the patient is willing and it results in relief from cluster headaches then it might be worth taking a look into. One of the more important characteristics of CHs to remember when ruling out other diagnoses is that CHs follow a pattern. They occur at generally the same time of day and same time of year and pain is typically always on the same side of the face. Being able to differentiate between a CH and a migraine is extremely important for diagnosis and treatment. Many patients with CHs are originally diagnosed with migraines and a correct diagnosis is then delayed, causing unnecessary medical management and a burden to the patient and healthcare system. If you would like to know more about the differential diagnoses between CH and other trigeminal autonomic cephalagias, check out Table 4 in Matharu and Goadsby's article. ↑ 3.0 3.1 3.2 Matharu MS, Goadsby PJ. Trigeminal autonomic cephalgias. J. Neurol. Neurosurg. Psychiatry [Internet]. 2002 Jun;72 Suppl 2:ii19–ii26. ↑ 4.00 4.01 4.02 4.03 4.04 4.05 4.06 4.07 4.08 4.09 4.10 4.11 4.12 4.13 4.14 4.15 4.16 4.17 4.18 4.19 Leroux E, Ducros A. [ttp://ukpmc.ac.uk/articlerender.cgi?tool=pubmed&pubmedid=18651939 Cluster headache]. Orphanet Journal of Rare Diseases. 2008; 3:20. ↑ 6.0 6.1 6.2 6.3 6.4 6.5 6.6 Rozen TD, Fishman RS. Cluster headache in the United States of America: demographics, clinical characteristics, triggers, suicidality, and personal burden. Headache [Internet]. 2012 Jan [cited 2014 Mar 22];52(1):99–113. ↑ 7.0 7.1 7.2 7.3 7.4 7.5 7.6 7.7 Silberstein, Stephen D. Cluster Headache. Merck Manual for Healthcare Professionals (Accessed 2 March 2010). ↑ 8.0 8.1 8.2 8.3 8.4 8.5 Beck E, Sieber WJ, Trejo R. Management of cluster headache. Am. Fam. Physician. 2005 Feb 15;71(4):717–24. ↑ 10.0 10.1 Goadsby PJ. Review Pathophysiology of cluster headache : a trigeminal autonomic cephalgia Pathophysiology of cluster headache. The Lancet: Neruology. 2002;1(August):251–7. ↑ 11.0 11.1 Schürks M, Kurth T, de Jesus J, Jonjic M, Rosskopf D, Diener H-C. Cluster headache: clinical presentation, lifestyle features, and medical treatment. Headache [Internet]. 2006 Sep [cited 2014 Mar 22];46(8):1246–54. ↑ Fernández-de-Las-Peñas C, Ortega-Santiago R, Cuadrado ML, López-de-Silanes C, Pareja J a. Bilateral widespread mechanical pain hypersensitivity as sign of central sensitization in patients with cluster headache. Headache [Internet]. 2011 Mar [cited 2014 Mar 22];51(3):384–91. ↑ Jensen R, Stovner LJ. Epidemiology and comorbidity of headache. The Lancet Neurology April 2008;7(4):354-361. ↑ 16.0 16.1 16.2 16.3 Edwards J. Diagnosis and management of cluster headache. Nurse Prescr. 2012;10(12):590–6. ↑ 17.0 17.1 17.2 17.3 17.4 Tfelt-Hansen PC, Jensen RH. 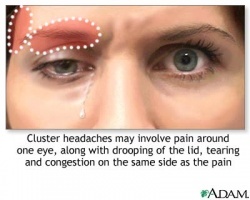 Management of cluster headache. CNS Drugs [Internet]. 2012 Jul 1;26(7):571–80. ↑ Sutton J, Herbert N. LSD for the Treatment of Cluster Headaches: Risk Report. Clusterbusters.com. ↑ Sostak P, Krause P, Förderreuther S, Reinisch V, Straube A. Botulinum toxin type-A therapy in cluster headache: an open study. J. Headache Pain. 2007 Sep [cited 2014 Mar 23];8(4):236–41.